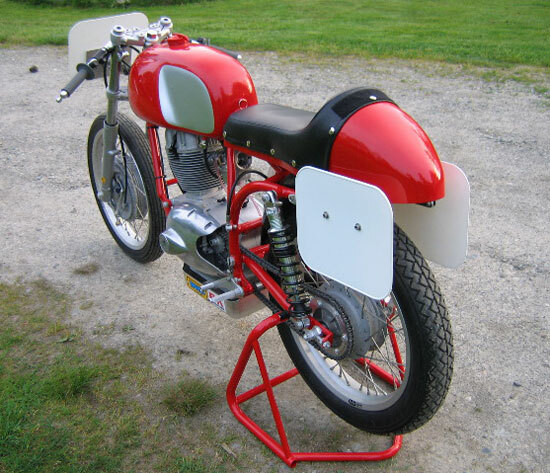 1966 Benelli Racer - Paul BrodieFlashback Fabrications Ltd. This bike came to me in pieces: wheels, frame, engine, Marzocchi forks from something else, and a Yamaha 650 front hub. The engine was already done. The “trick” was to put it all together as a Vintage race bike. The engine is a 250 single, 2-valve pushrod, with a 4-speed gearbox. It never looked this racy in 1966; it was a department store bike sold by Montgomery Ward and used to look decidedly homely! I really enjoyed working on this project. It took me back to a time when motorcycles were simple. Nothing is hidden. What you see is what you get. No plastic either, except for the number plates. “I have always liked the “catalog” bikes of the 1960s and I rode a 98cc Ducati and 125cc Puch Allstate as a 14-year-old. The style and engineering of the Sears/Gilera 108 cc and Wards Riverside/Benelli 250cc bikes were appealing to a young motorbike rider. The Benelli racer project started with a bike found in a Montana farmer’s field. The bike was found with rotten tires on Akront rims, and the wrong reach spark plug cross threaded in the cylinder head! This accounted for the relatively good condition of the rest of the engine. All extra tabs were cut off the frame, and the swingarm was straightened. Stops for the rear brake cable were welded on, and a custom exhaust fabricated. 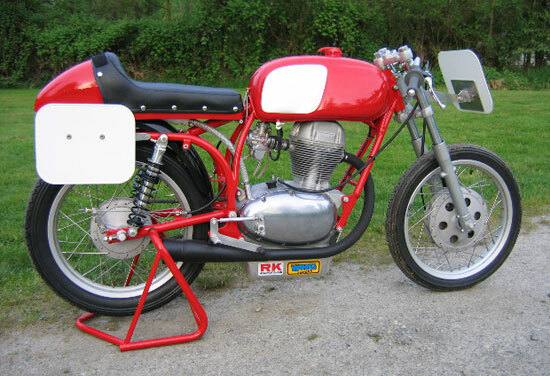 The tank was painted red with silver panels, inspired by some pictures of early Benelli racers. Forks were sourced in England from a 2C Benelli and 18-inch alloy wheels were laced to a XS650 200mm front brake and Benelli rear brake. Paul sourced the controls and fabricated all the rearsets and linkages. The engine was prepared by a Benelli collector and uses a BSA 10:5 A10 piston conversion. The cam was reground to race specification and a 30mm Mukini carb was fitted.